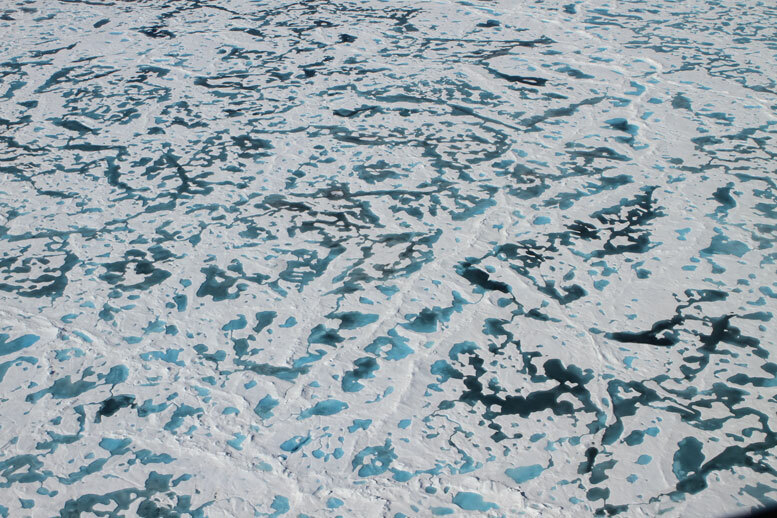 The thinning of Arctic sea ice has increased the number of melt ponds — dark pools of water on the ice surface — and permitted enough sunlight to penetrate to the ocean water that phytoplankton has been blooming under the ice. A team of researchers is using a new model to explain the blooms of phytoplankton growing under Arctic sea ice. In 2011, researchers observed something that should be impossible — a massive bloom of phytoplankton growing under Arctic sea ice in conditions that should have been far too dark for anything requiring photosynthesis to survive. So, how was this bloom possible? Using mathematical modeling, researchers from the Harvard John A. Paulson School of Engineering and Applied Sciences (SEAS) found that thinning Arctic sea ice may be responsible for these and more blooms in the future, and could potentially cause significant disruption in the Arctic food chain. The research is described in Science Advances and is a collaboration between researchers from SEAS, University of Oxford, and University of Reading. Phytoplankton underpins the entire Arctic food web. Every summer, when the sea ice retreats, sunlight hitting the open water triggers a massive bloom of plankton. The plankton plumes attract fish, which attract larger predators and provide food for indigenous communities living in the Arctic. Phytoplankton shouldn’t be able to grow under the ice because ice reflects most sunlight back into space, stopping it from reaching the water below. But over the past decades, Arctic ice has gotten darker and thinner due to warming temperatures, allowing more and more sunlight to penetrate to the water beneath. Large, dark pools of water on the surface of the ice, known as melt ponds, have increased, lowering the reflectivity of the ice. The ice that remains today is thin and getting thinner. The team’s mathematical modeling found that while the melt ponds contribute to conditions friendly to blooms, the biggest culprit is ice thickness. This research was co-authored by David Rees Jones, Sarah Iams, David Schroeder, Daniela Flocco, and Daniel Feltham. It was supported in part by the National Science Foundation. Be the first to comment on "New Model Helps Solve the Mystery of the Arctic’s Green Ice"